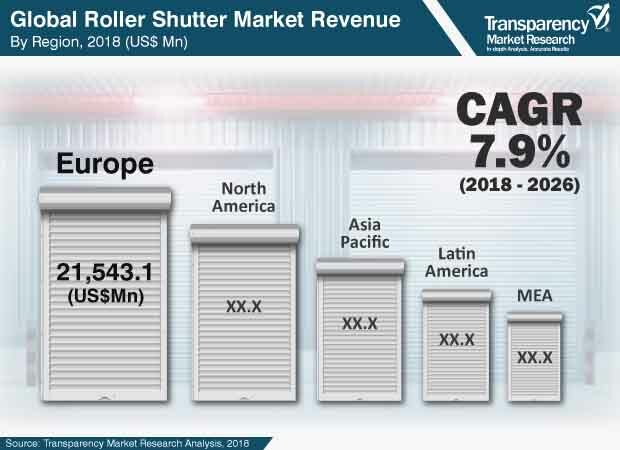 According to a new market report published by Transparency Market Research titled “Roller Shutter Market – Global Industry Analysis, Size, Share, Growth, Trends, and Forecast, 2018 – 2026,” the global roller shutter market is expected to reach US$ 92.3 Bn by 2026, expanding at a CAGR of 7.9% from 2018 to 2026. Europe held the highest market share in the roller shutter market in 2017. Roller shutters act like insulators and they protect a space from rain, light, heat, or sound. Quality shutters can regulate indoor temperatures, keeping heat from getting out and minimizing the amount of cold air that is entering a space. The main benefit of roller shutters is that they provide security to ahome from intruders. It is hard to remove the roller shutters by intruders because the roller shutters are very closely fitted to the door or window and cannot be pulled away without a great deal of effort. Roller shutters provide safety from natural disasters and burglary. These products are mostly used in Europe. Homeowners install roller shutters for the safety of their houses from any physical damage. Fireproof roller shutters are also available in the market. They are gaining traction as they offer fire resistance up to a certain number of hours. Traditionally, roller shutters were operated manually. However, with the advancement of technology, consumers are moving to automatic and motor-operated roller shutters. Currently, roller shutters can be operated by one touch or remote control technology. Demand for electromechanical and digital roller shutter is continuously increasing. Europe and North America significantly employ automated roller shutters in their commercial and residential spaces. These two regions comprise 60% share of the global market. Asia Pacific is an attractive roller shutter market too. With the rapid economic growth in the region, there has been a boom in businesses and this has led to high uptake of roller shutters doors. The increasing spending capacity of people and the home buying spree has also enabled the market to grow in the region. Construction of residential and non-residential buildings along with renovation and changing lifestyle of consumers are likely to drive the roller shutters market at a good pace. Key trends supporting the growth of the market includes new construction of non-residential buildings, which has seen an increase since 2012. Moreover, private commercial buildings along and the private industrial sector are seeing a significant rise in growth. The roller shutter market is now at a mature stage in North America and Europe, and the degree of consumption is continuously increasing in these regions. Increased use of roller shutters can be attributed to the growing concern for protection, safety, and security. Noise reduction and climate control are also contributing to the growth of the roller shutter market across the globe. European consumption accounts for about 43% of the total market.The market in Asia Pacific is witnessing significant growth due to the growth of industries and rapid urbanization. By product type, the built-in roller shutter segment is expected to have the highest CAGR of 8.1% from 2018 to 2026. The growth of this segment is attributed to its aesthetic factor. Built-in roller shutters are not visible from outside and does not affect the external appearance of the building. Europe accounted for 43.0% of the global roller shutter market in 2016 and is anticipated to continue its dominance over the forecast timeline. Asia Pacific region is witnessing significant growth with highest CAGR due torapid urbanization and industrialization in this region. The Asia Pacific market is expected to lead other regions in terms of growth over the forecast period. The roller shutter industry is characterized by a number of local and regional players and intense competition among them. Some of the industry participants in the global roller shutter market are AM Group, Alulux GmbH, Assa Abloy Group, Bunka Shutter Co., Ltd., Ferco Seating Systems, Heroal, Hormann Group, Novoferm Gmbh, Sanwa Holdings Corporation, SKB Shutters, Stella Group, and Zurflüh Feller.